Will EA Bring Gaming Titles to Windows Phone 7? "If you examined the fairly impressive roster of Windows Phone 7 Xbox Live launch titles that Microsoft waved proudly in our face the other day, you might've noticed that EA is particularly absent from that glorious list. Well, the folks at Mobile Entertainment bothered to ask EA Mobile about that absence, and EA had this terse reply: "We are constantly evaluating new platforms and opportunities, but have nothing to announce right now."" 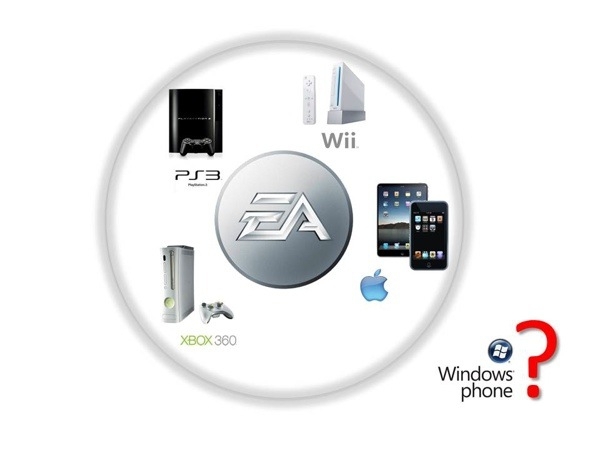 EA is a titan in the gaming world, with titles in virtually all genres and support for numerous platforms, including the PC, Wii, Xbox 360, Playstation 3, Nintendo, iPhone, iPod, iPad, and, of course, the web. As Engadget has pointed out, it is fairly odd that they've made no explicit comment on their intentions for the Windows Phone 7 platform. There are a number of possible reasons for this. They may be taking a "wait and see" position to determine just how well the platform will do in the marketplace. They could just have too many projects underway on other platforms to take on the new Windows Phone 7. They might even be holding something back for a surprise at launch time. They definitely have a long-term relationship with Microsoft as represented by some of the stellar sports games available on the Xbox 360 platform. It seems we will just have to hold on a bit to see if their support is forthcoming. In the meantime, do any of our readers have thoughts or insight as to what might be at "play" here? Wouldnt put it past apple to have exerted some pressure on EA to withold games from WP7. Nobody cares for windows mobile anymore. I think it could go either way. MS is paying/guaranteeing developers. There is no telling how much they would promise EA for some good games.